This just comes from experience. Be very aware if you had a good streak and be more careful than you normally would and really you should probably restrain yourself and try to do nothing unless you are really, really sure because the hubris, the arrogance which comes from a good trade or certainly from a lot of good trades wether we like to not we are all human. Probably you should close the window and read a book or something and do nothing for a while. Anything that people can do to make money, they should do. I have nothing against any of it. If throwing darts its your way and it works, then do it! So I do not have any opinions, for or against, on how people make money, on how people invest their money. There are always new ways to invest, there always have been since the beginning of time and these guys that do algorithmic trading if they know what they are doing, if it works for them, they should do it. Of course there are trades like that. I wish I knew one right now. If you can find something that is worth all of your money and you know you are right, of course, I would love that trade. It teaches you about yourself, about the markets and about everything else. Many people do not come back from collapses or from failures, some do, some do not come back after two or three failures. You learn a lot about yourself. First of all there is no stock market in North Korea, so you have to go there and do things directly, which it turns out to be legal , there are some things you can do in North Korea as an American citizen which are legal, there are some that you cannot. You cannot go into the weapons business, you cannot go to the Uranium business but there are some things that you can do to my surprise. And there are even American christians living in North Korea and doing business. There are many changes taking place. The reason we moved to Singapore is because I want my children to know Asia and to speak Mandarin because Asia is going to be the most important continent in the 21st Century. 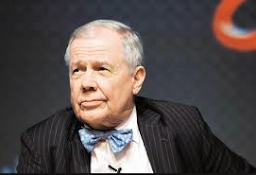 Watch Jim Rogers investing presentation on Invest Global 2015, Singapore. There is nothing like going broke to make you focus. I lost everything. I thought I was a really smart guy, I made wonderful investments, made a lot of money and then I said, "I will do that again!" And I got wiped out. That shows how little I knew at the time. But it taught me to be very careful, it taught me to make sure I knew what I was doing. And it also taught me that there has a lot of things I did not know about the markets. You must do a lot of research, you must invest only in what you know. Do not listen to me, do not listen to the television, invest only in what you know about and if your emotions get involved, you are in big trouble. Take your emotions to the football game, take your emotions to the bar, do not take your emotions to the investment world because you are going to get destroyed. Markets: We Are Going To Have A Big Problem. We are in a very, very artificial period. It stye first time in recorded history that you have all the major central banks, Japan, U.K., Europe and America printing staggering amounts of money. The people getting that money are very happy. But it is artificial, if you look out the window, I am sure you are going to see a rising tide of liquidity. When it ends, and it will end, we are going to have a big, big, problem. Read the latest Jim Rogers interview: "Jim Rogers On Why You Must Understand China and What After North and South Korea Unite"
On this interview Jim Rogers covered various topics like China, how Japan will be impacted if North and South Korea unite and how to find investment opportunities in Myanmar and North Korea. Video: Where Should Greece Look For Money? Greece Can Never Pay Its Debt. Never. Greece can never pay its debt. Never, ever, ever, ever. It is physically impossible. But they can try to delay it and delay it and delay it and that is what this is all about. If they made the currency convertible, and if they made it easier for foreigners to buy shares in India, if they made the markets more open, I would buy a lot of India right away. I am afraid they are not going to do that yet, but they should. This is 2015. I own shares in India for the first time in a long time, partly because of the Central Banker and partly because of the new Prime Minister. The new Prime Minister has not produced much yet, but I hope he will, because if he does not produce soon, everybody is going to give up, including me. We are going to have serious problems. The American stock market has been going up almost straight up for 6 years. That is very unusual. At the same time debt has been going higher and higher all over the world and central banks have been printing a lot of money. That is not normal. When this ends, it is going to be much worse than the last time we had a big collapse in the financial markets. Gold has not had a 50 percent correction in many, many years. That is not normal. If gold goes down 50 percent, which would be under 1,000 dollars an ounce, that is not a prediction, I am just saying if it happens, which would be normal, I will buy a lot more gold. Janet Yellen is going to raise interest rates or the market is going to raise interest rates. Rates are going to go higher and when that happens the Japanese are not going to raise rates, the Europeans are not going to raise rates. So, the dollar can go much, much higher. It is my largest position.